This is a picture of a flyer which hangs in my house. The campaign for Votes for Women was long, and fought on many fronts, and pamphleting was an important part of it. One hundred years ago today, the first women (over 30, propertied) achieved the right to vote. You can see on this flyer that the President of the National Union of Suffrage Societies is listed as ‘Mrs Henry Fawcett’ – not as Millicent – who we have grown accustomed to hearing of, and to celebrating. Soon there’ll be a statue in Parliament Square. Her listing here suggests that even for campaigning households, changing social norms in public could be a gradual process. So how did I come by this little piece of social history? Probably not where you’d most likely expect. A few years ago, I was up in the Highlands, and on a day when the weather was less than ideal for outdoor activities, we went to the book fair in the local town to pass a bit of time. It was there that I found the flyer – under a few layers of unremarkable stuff, in a transparent pocket on an antiquarian’s stall. 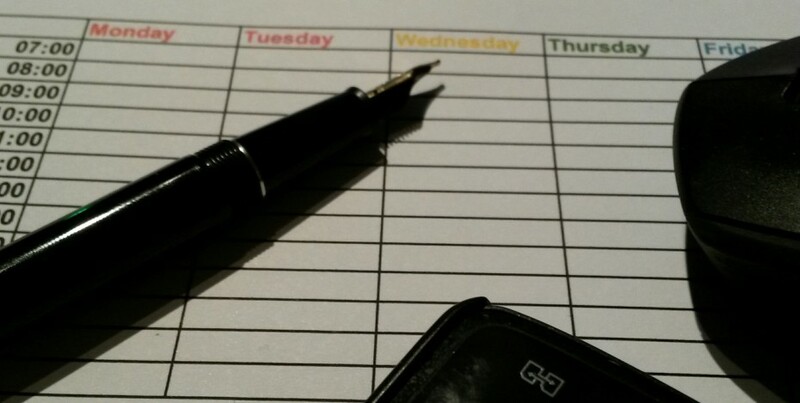 I was intrigued and spent a bit of time reading through it – my kids came over to see what I was doing – ‘that’s so you’ they declared – finding something feminist in an unlikely venue.…. But should I have been surprised to find it in the Highlands, in a back-of-beyond kind of place? Turns out, not so much as you might have thought. My artefact prompted me to find out a bit more about suffrage movements in Scotland, and what the word on the street, well North of Watford Gap, would have been. I discovered that both suffragist and suffragette movements were, in fact, highly active North of the border. Edinburgh had one of the earliest suffrage societies, founded in the 1870s. I’d not noticed before that Winston Churchill stood as an MP in Dundee, and was apparently regularly confronted by women campaigning for the right to vote in the early 1900s. Meanwhile, in comparatively provincial Perth there was a prison where women protestors were force-fed in the same brutal way as happened in London. Scottish churches supported votes for women and spread the word, and women in Highland fishing communities were also activists. A bit of browsing online shows that there was a young female piper who played on marches for the Suffragettes, and a range of Scottish women who made their mark upon the movement – including Marion Wallace Dunlop, who was instrumental in the use of hunger strikes as protest. My dip into the Scottish story shows that women everywhere in the UK played their part in giving us the vote. 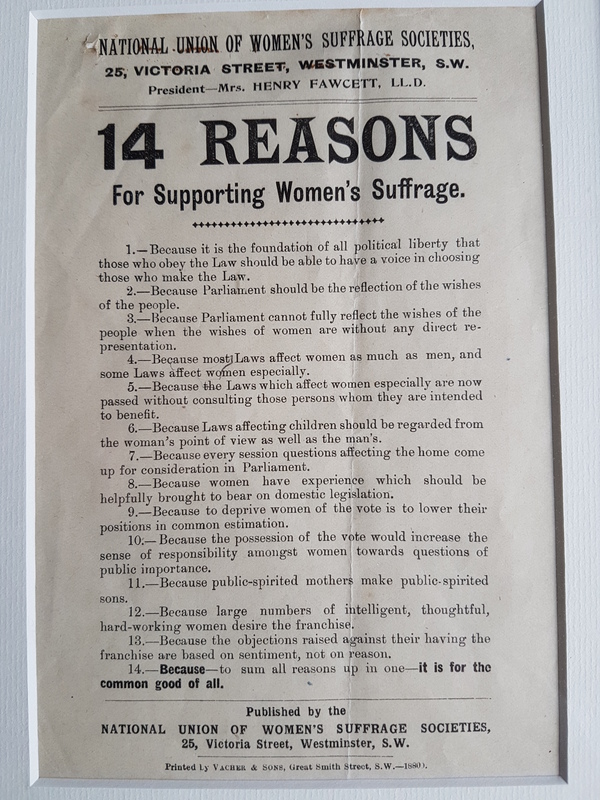 On the flyer, the 14 reasons for supporting women’s suffrage make a vital connection between women’s experience and legislation – laws should be made by all those who abide by them, and reflecting the interests of all. But the later reasons listed touch on something else as well – that women should have the vote because they desire it, and that objections to this are not based on reason. The fight for votes for women put women’s agency on the agenda, and made the case for women’s place as full participants in public life. One reason sums it up: ‘it is for the common good of all’. Representation really matters – on the pages of history, and in the corridors of power.